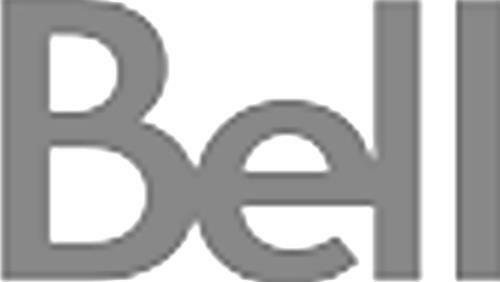 On Thursday, November 27, 2008, a canadian trademark registration was filed for the above pictured logo by Bell Canada 1 carrefour Alexander-Granham-Bell, , Building A7, Verdun, Quebec, QUEBEC, CANADA H3E3B3. The Canadian IP office has given the trademark application number of 1419931. The current status of this trademark filing is Registration published. The correspondent listed for is LALANDE AVOCATS S.E.N.C. / LAL of 1 Carrefour Alexandre-Graham-Bell, Édifice A7, Verdun, QUÉBEC, CANADA H3E3B3 The trademark is filed in the description of Telecommunication services namely, transmission of voice, images, video, voice messages, through global computer networks, the Internet, telephones, cellular phones, mobile phones, walkie-talkies, pagers, answering and caller display machines, radios, satellite dishes, cable sets, top receivers, set-top boxes and decoders, Portable Video Recorders (PVR), cables and wire lines, routers, web servers; prepaid or post-paid access card services for use with phones, computers, handheld devices, the Internet and television programming. , Telecommunication products, namely, residential and commercial telephones, cellular phones, portable phones, mobile phones, walkie-talkies, pagers, answering and caller display machines, headsets, coaxial cables. , Satellite television receivers, decoders and converter boxes, audio/video cables, Personal Video Recorders (PVR), satellite dishes, satellite antennas, radio wave antennas, set top receivers, television remote controls, encryption devices for residential collective and commercial receiver systems; electronic parts and fittings for the aforesaid products, wires and wire connectors, audio speakers, remote extenders, radio light wave, wire transmitters, receivers and telecommunication switches and television antennas. , Providing storage and delivery of voice, data, images, video, information, documents, text messaging, browser services for phones, computers, handheld devices, the Internet and television programming; music downloading, caller ring tunes, caller ring tones, call display, electronic mail, Internet access, television access, by prepaid or post-paid calling cards, by wire and wireless phones, by cellular phones, by digital telephones, by facsimile transmission, by telegram transmission, by radio or wave transmission, by walkie-talkie transmission, by camera transmission, by television transmission, by cable and satellite transmission, by electronic transmission; providing voice, data, images, video, information, documents, text messaging, games, music downloading via the global network and computer terminals and other means of communications namely phones, computers, handheld devices, the television and the Internet. , Electronic Data Interchange (EDI), facsimile transmission, provision of access cards and CD Rom services for the connections to network terminals, global computer networks, the Internet or local computer networks, electronic processing for use in accessing, storage, management, transmission of voice, data, image, information, documents and messages through use of telephone lines, global networks, computer networks, the Internet, facsimile devices, the television, cable and satellite devices, phones, computers, mobile phones, Interactive voice identification and recognition services, Voice over Internet protocol (VoIP) services; Digital voice telephony services; voicemail via email, call display, visual call waiting, 3-way calling, call screening, call blocking. , Telecommunication equipment namely telephone booths, parts, fittings and accessories thereof, telephones, computer and global network terminals; computer cables, routers, modems, transmitters and servers for transmission, emission and reception of signs, signals, writing, images or sounds or intelligence of any nature by wire lines, radio, or visual. , Air-to-ground telecommunication equipment namely, telephones and portable facsimile equipment. , Operation of an Internet radio station. , Providing post-paid wireless communication services by analog or digital telephones, recordal, storage and subsequent delivery of messages by telephones. , Computer hardware; phone line filters, modems, interactive public computers and phone terminals; wireless communication base stations, antennas, towers, parts, fittings and accessories thereof. , Computer hardware and software for the transmission and recording of telemetric data using wireless communication networks for the purpose of satellite-aided vehicular fleet management systems. , Providing paging services and two-way paging and messaging services. , Radio transmission services via walkie-talkies or other wave transmission devices. , Global positioning system (GPS) receivers and transmitters. , Computer software in the form of disc drives, tapes, CD-ROMs and memory cards to access global computer networks and the Internet local computer networks. , Delivery of cable, satellite and IP television services to residential, commercial and Governmental customers. , Telecommunication voice services, namely the provision of a local access phone line, long distance calling, voice mail and call management features in one telephony solution. , Computer software for use in data base management in the field of communications and telecommunications providing access to global networks, global computer networks, the Internet and interactive computer networks, related guides and manuals thereof. , Computer software for use in sending, receiving, sorting, managing and archiving emails and attached documents. , Air-to-ground telecommunication services namely, telephone services for airplanes. , Telecommunications and communications service involving the transmission of billing details to subscribers through use of phones, computers, handheld devices and the Internet. , Computer software for creating and designing web sites. , Computer software for use in creating a web catalogue, for searching and retrieving, sorting, managing and archiving information across computer networks; a directory of information sites, and resources available on computer networks recorded on compact disk, diskette, tapes, memory cards. , Call centre services, namely designing, implementing, operating and managing services and providing facilities for receiving and forwarding communications. , Electronic information service provided over global computer networks, the Internet or local computer networks and relating to telecommunications and communications products and services. , Computer software used in database management of emergency measure's critical data and emergency communication services. , Software for use with interactive and animated virtual personages and animals for online support, marketing, sales, customer care services and solutions in the field of communications and telecommunications through a global network, phones, computers, mobile phones, the television and the Internet. , Telecommunication services namely Internet portal services providing online portals network of websites and related services, including Internet content, search services, multimedia and streaming services, directory search services; webpage building and web hosting services, namely web site hosting and web site design services; Internet service provider (ISP) services; Telecommunication services namely providing access to third parties web content; providing storage and retrieval of data in the fields of business, finance, news, information, sports, entertainment, games, music, health, shopping, securities, insurance, education, travels, weather, currents events, reference materials, government services; creating indexes of information sites and other resources available on computer networks; Management of a computer applications network of interactive public kiosks; Dissemination of advertising promoting the goods and services of others through an online electronic communication network namely computer networks, phones, handheld devices and the Internet; Customer support for multimedia interactive computer applications, basic network access and various Internet applications; providing computer programs developed by others. , Providing wire and wireless Local Area Network (LAN), and WiFi solutions for computers, wireless computer networks, video, e-mails, Intranet, Internet and telephone communications using multipoint bases and terminals. , Digital memory cards used for storing and transferring data, sounds, pictures, music, videos; USB flash drives used for storing and transferring data, sounds, pictures, music, videos. , Audio and visual recordings, videotapes, videocassettes, cassettes, videodiscs, CD-ROMs, DVDs, memory cards, kinescope recordings of television programs and films of television programs. , Telecommunications services, namely digital transmission of voice, images and video for the television, computers, phones, handheld devices and the Internet; delivering Internet Protocol-based applications over broadband networks; Voice and data network services providing businesses with applications, namely IP VPN Remote Access, business Internet dedicated, Ethernet Inter-networking, High-Speed services. , Internet hosted applications. , Pre-recorded video cassettes, pre-recorded videotapes. , Calling cards, prepaid calling cards. , Telecommunication services, namely broadcasting TV contents, images, video, sounds and voice communications by means of satellite, cable, fibre, switching and Internet technologies; Internet services, namely voice over Internet Protocol (VoIP) phone calls, recording and transmission of data, images, video, sounds, repertories, TV contents, voice mails, voice and video for conference applications. , Delivering a hosted solution that provide customers with an advanced intranet management application enabling the automation of many collaboration and business processes by deploying horizontal and vertical solution templates, including customized modules and extranet applications. , Printed or electronic matters and publications, namely telephone directories, television and mobile phones information magazines, manuals, guides. , Web information namely, newsletters, magazines and guides that contain program-listing schedules with respect to satellite and cable television programs and pay-per-view television services, manuals for instruction, education and information. , Telecommunication services namely providing online interactive and animated personages and animals for the exchange of information and advertisement applications. , Telecommunications services namely, single and multi-line services, namely single access business lines and business access lines to customer systems; service enhanced calling features, namely voicemail messaging; video-email messaging. , Computer game information provided by means of a global computer network, namely, an electronic computer game magazine and games on demand. , Global communication network services, namely the provision of management services to supervise, review, direct and coordinate the operations of electronic communication and telecommunication networks; leasing access time to computer databases or networks in the field of telecommunications. , Electronic mail services through wired and wireless access, paging services, wireless digital messaging services. , Broadband network services and infrastructure for telecommunications companies including the selling and leasing of dark fibre to global computer networks or Internet service providers and other local exchange carriers; construction and maintenance of fibre optic, cable television, Internet and telephony networks; interconnection of customers between multiple fibre optic networks. , Providing diagnostic and tools to repair Internet, phone and TV connections, email and Web-browser problems through a computer. , Providing a push button signalling application for telecommunication services. , Providing an application enabling subscribers to determine the origin of a call or the identity of the intended recipient. , Providing an application enabling customers to move from analog business processes to digital business processes, and creating integrated electronic communications systems. , Providing an electronic or digital facility enabling customers to exchange information for public and private sector commercial or official transactions by means of integrated electronic communications systems. , Consulting, implementation, installation, development, integration, management, maintenance, support, logistic and repair services for computer hardware and software planning, development, design, testing, deployment, data storage, network infrastructure, security, privacy solutions and selection all performed for others. , Business management consultation in the fields of telecommunications, systems integration services, facilities management; Installation, repair and maintenance services for custom and packaged computer software, for network monitoring and management; Installation, repair and maintenance services for computer hardware and software for diagnostic, control, monitoring, performance measurement and management information relating to telecommunications; installation, maintenance and repair services for telecommunication cables, wires and satellite-based equipment, parts, fittings and accessories thereof; undersea, underwater or underground cable and satellite repair services. , Consulting services in the field of data processing and information management. , Technical consulting services in the field of computers; computer services providing access to a computer database in the field of digital business services with a graphical interface to a global computer network for the transfer and dissemination of a wide range of information; engineering, consulting and computer software development services in the telecommunications industry, namely, interface analysis, design deployment, testing and database tracking of microwave broadband and satellite earth stations. , Operation of retail outlets and stores, web sites, virtual stores where customers can purchase, rent or lease products and services in the fields of telecommunication, communication and home security. , Manufacture, sale, rental, installation, delivery and operation of telecommunication booths, telephone kiosks and their components, parts, fittings and accessories thereof, namely telephones, computers, televisions and global network terminals. , Global Positioning communication services, namely providing access to Global Positioning Systems (GPS) and cellular networks to enable users to obtain directions, locations, images and information from their mobile telephone, computers and hand-held devices; Providing a service used to track and locate people, assets and inventory by honing in a computer, on a wireless handheld device, modem or other device using GPS technology and cell tower triangulation combined (Assisted GPS); providing a service used to find the location of people, assets and inventory in a web-based environment on the computer, a wireless handheld or other device; Providing use of a Global Positioning System (GPS) application combined with a cellular network to track and locate people, assets and inventory by locating Assisted GPS-enabled cellular phones, wireless data devices, handheld devices, computers, portable computers (PC) and wireless-pocket computers. , Telecommunication services, namely Internet hosted solutions providing Internet and wireless access to email messages, contacts list, calendars, tasks, notes, sharing file documents, through various computing devices such as computers, portable computers (PC), wireless-pocket computers, mobile wireless devices, namely, mobile phones, handheld computers and devices, personal digital assistants (PDAs) and smart phones. , Design of digital broadband communication systems and networks for voice, video, cable television or data according to customer specifications in the fields of communications, telecommunications and electronic commerce, information management and data processing. , Outsourcing services offered to customers in the fields of communications, telecommunications, the Internet and electronic commerce. , Business consultation and support services offered to customers for providing management solutions in the fields of communication and telecommunication technologies. , Education services, namely providing of training, conducting courses, classes, conferences, workshops and seminars to user in the field of communications and telecommunications, the Internet, the electronic commerce, information management and data processing. , Communication services, namely radio and television broadcasting, and broadcasting distribution; Communication services, namely satellite television transmission services in the nature of non-programming information and interactive television services; Direct to home broadcasting by satellite and cable; Pay-per-view television services. , Telecommunications services namely emergency assistance and dispatching services; public announcement service designed to allow message sponsors to provide live, passive or interactive public announcement messages to telephone and Internet customers. , Recording for visually and orally received, for conducted or for broadcast transmission of messages or programs through all available commercial means, namely films, video tapes, discs, CD-ROMs, DVDs, electronic files and cassettes. , Multimedia production and broadcast services, namely broadcasting of music, new, radio and television programs offered by way of multimedia applications including CD-ROMs, DVD, databases, global computer networks, the Internet, local computer networks, computers, television, radio and other means of communications. , Entertainment services, namely the production, broadcast, recording, transmission and distribution of television programs and the operation of television and radio networks. , Providing computer game information and game contest information by means of a global computer network, the Internet or local computer networks namely an electronic computer game magazine. , Providing electronic games by means of a global computer network for the access to a wide portfolio of game contents; providing electronic game contests by means of a global computer network. , Providing access to electronic directory consultation services, electronic mail services. , Providing public multimedia kiosks (computer terminal, touch screen, keyboard, card reader, debit pad, printer) where customers can access the Internet and their e-mails. , Advertising services namely, advertising the telecommunication wares and services for others; telephone directory services, data and voice telecommunication related service namely providing updated residential or business telephone number listings, addresses and directions. , Promotional advertisements for others through global computer networks, the Internet, local computer networks, wire line, wireless phones, handheld devices and other available commercial means namely store flyers and product promotional material for others. , Providing promotional services to others namely the sale and distribution of telecommunications services and equipment through sport-related promotions, sponsorships and through contests involving sport-related prizes. , Promoting the sale of telecommunication services and equipment for others through the distribution of printed material and promotional golf and tennis contests; promoting goods and services for others by arranging for sponsors to affiliate telecommunication goods and services with golf and tennis competition. , Telecommunication network infrastructure services namely, design, development and engineering of networks and equipment used therein; outside plant construction namely, installation of underground cable conduits and cable networks, cable testing; installation and upgrading of telephone central office equipment and DC power plant systems; project management in the field of telecommunication networks for others; providing emergency cable network restoration services; maintenance and repair of telecommunication networks, cable, coaxial cable and fibber optic splices; material management services for the telecommunications industry, namely, sourcing, purchasing, warehousing, transport and delivery and disposal of surplus or obsolete materials. , Providing disaster recovery and restoration to telecommunications networks; Network infrastructure services provided to the wireless, broadband and microwave industry, namely, design, development, engineering, construction, network planning, installation and optimization of networks and equipment used therein. , Providing cellular in-building coverage and billing solution, enhancing voice and data communications with the ability to interface with a customer's PBX (Public Branch Exchange) system, in using a single wireless handset or simultaneously on both cellular and land line phones using a unique dialling number. , Providing audio, web and video teleconferencing services to others via telephone lines, cable, or wireless devices; Providing Web conferencing services for setting up and managing over the Internet; Web conferencing services providing an interactive voice and data conferencing platform offering document and multimedia hosting and archiving services, online collaborative content onto a traditional conference call enabling users to schedule calls online, to share and to archive collaborative document and applications through the Internet namely white boarding, pre and post-conference content (access, research and control tools), voice archiving, chatting, conducting polls via a Web Interface conference controls and instant access and Web touring (content, research tools). , Provision of an incentive program for high use cellular telephone subscribers. , Providing information though cellular telephones and handheld devices for communicating critical emergency information to public safety answering points. , Providing call-routing services and monitoring telephone calls for notifying emergency facilities. , Providing telecommunication bundles allowing customers to reach cellular phones, voicemail and call routing between wire line and wireless phones, voicemail boxes, computers, hand-held devices and the Internet. , Providing bundles for telephone and Internet communications, television communications, prepaid telecommunications by calling cards, by cellular phones, by digital phones, by recordable, storage and subsequent delivery of voice messages by telephones, handheld devices and a global network. , Rate plans for personal and business communications, for transmission services via telephones, handheld devices, computers, walkie-talkies; Internet rate plans; Cable and satellite television programming rate plans; rate plans for wire line and wireless telecommunication services bundles. .
(1) - Telecommunication services namely, transmission of voice, images, video, voice messages, through global computer networks, the Internet, telephones, cellular phones, mobile phones, walkie-talkies, pagers, answering and caller display machines, radios, satellite dishes, cable sets, top receivers, set-top boxes and decoders, Portable Video Recorders (PVR), cables and wire lines, routers, web servers; prepaid or post-paid access card services for use with phones, computers, handheld devices, the Internet and television programming. (2) - Telecommunication products, namely, residential and commercial telephones, cellular phones, portable phones, mobile phones, walkie-talkies, pagers, answering and caller display machines, headsets, coaxial cables. (3) - Satellite television receivers, decoders and converter boxes, audio/video cables, Personal Video Recorders (PVR), satellite dishes, satellite antennas, radio wave antennas, set top receivers, television remote controls, encryption devices for residential collective and commercial receiver systems; electronic parts and fittings for the aforesaid products, wires and wire connectors, audio speakers, remote extenders, radio light wave, wire transmitters, receivers and telecommunication switches and television antennas. (4) - Providing storage and delivery of voice, data, images, video, information, documents, text messaging, browser services for phones, computers, handheld devices, the Internet and television programming; music downloading, caller ring tunes, caller ring tones, call display, electronic mail, Internet access, television access, by prepaid or post-paid calling cards, by wire and wireless phones, by cellular phones, by digital telephones, by facsimile transmission, by telegram transmission, by radio or wave transmission, by walkie-talkie transmission, by camera transmission, by television transmission, by cable and satellite transmission, by electronic transmission; providing voice, data, images, video, information, documents, text messaging, games, music downloading via the global network and computer terminals and other means of communications namely phones, computers, handheld devices, the television and the Internet. (5) - Electronic Data Interchange (EDI), facsimile transmission, provision of access cards and CD Rom services for the connections to network terminals, global computer networks, the Internet or local computer networks, electronic processing for use in accessing, storage, management, transmission of voice, data, image, information, documents and messages through use of telephone lines, global networks, computer networks, the Internet, facsimile devices, the television, cable and satellite devices, phones, computers, mobile phones, Interactive voice identification and recognition services, Voice over Internet protocol (VoIP) services; Digital voice telephony services; voicemail via email, call display, visual call waiting, 3-way calling, call screening, call blocking. (6) - Telecommunication equipment namely telephone booths, parts, fittings and accessories thereof, telephones, computer and global network terminals; computer cables, routers, modems, transmitters and servers for transmission, emission and reception of signs, signals, writing, images or sounds or intelligence of any nature by wire lines, radio, or visual. (7) - Air-to-ground telecommunication equipment namely, telephones and portable facsimile equipment. (8) - Operation of an Internet radio station. (9) - Providing post-paid wireless communication services by analog or digital telephones, recordal, storage and subsequent delivery of messages by telephones. (10) - Computer hardware; phone line filters, modems, interactive public computers and phone terminals; wireless communication base stations, antennas, towers, parts, fittings and accessories thereof. (11) - Computer hardware and software for the transmission and recording of telemetric data using wireless communication networks for the purpose of satellite-aided vehicular fleet management systems. (12) - Providing paging services and two-way paging and messaging services. (13) - Radio transmission services via walkie-talkies or other wave transmission devices. (14) - Global positioning system (GPS) receivers and transmitters. (15) - Computer software in the form of disc drives, tapes, CD-ROMs and memory cards to access global computer networks and the Internet local computer networks. (16) - Delivery of cable, satellite and IP television services to residential, commercial and Governmental customers. (17) - Telecommunication voice services, namely the provision of a local access phone line, long distance calling, voice mail and call management features in one telephony solution. (18) - Computer software for use in data base management in the field of communications and telecommunications providing access to global networks, global computer networks, the Internet and interactive computer networks, related guides and manuals thereof. (19) - Computer software for use in sending, receiving, sorting, managing and archiving emails and attached documents. (20) - Air-to-ground telecommunication services namely, telephone services for airplanes. (21) - Telecommunications and communications service involving the transmission of billing details to subscribers through use of phones, computers, handheld devices and the Internet. (22) - Computer software for creating and designing web sites. (23) - Computer software for use in creating a web catalogue, for searching and retrieving, sorting, managing and archiving information across computer networks; a directory of information sites, and resources available on computer networks recorded on compact disk, diskette, tapes, memory cards. (24) - Call centre services, namely designing, implementing, operating and managing services and providing facilities for receiving and forwarding communications. (25) - Electronic information service provided over global computer networks, the Internet or local computer networks and relating to telecommunications and communications products and services. (26) - Computer software used in database management of emergency measure's critical data and emergency communication services. (27) - Software for use with interactive and animated virtual personages and animals for online support, marketing, sales, customer care services and solutions in the field of communications and telecommunications through a global network, phones, computers, mobile phones, the television and the Internet. (28) - Telecommunication services namely Internet portal services providing online portals network of websites and related services, including Internet content, search services, multimedia and streaming services, directory search services; webpage building and web hosting services, namely web site hosting and web site design services; Internet service provider (ISP) services; Telecommunication services namely providing access to third parties web content; providing storage and retrieval of data in the fields of business, finance, news, information, sports, entertainment, games, music, health, shopping, securities, insurance, education, travels, weather, currents events, reference materials, government services; creating indexes of information sites and other resources available on computer networks; Management of a computer applications network of interactive public kiosks; Dissemination of advertising promoting the goods and services of others through an online electronic communication network namely computer networks, phones, handheld devices and the Internet; Customer support for multimedia interactive computer applications, basic network access and various Internet applications; providing computer programs developed by others. (29) - Providing wire and wireless Local Area Network (LAN), and WiFi solutions for computers, wireless computer networks, video, e-mails, Intranet, Internet and telephone communications using multipoint bases and terminals. (30) - Digital memory cards used for storing and transferring data, sounds, pictures, music, videos; USB flash drives used for storing and transferring data, sounds, pictures, music, videos. (31) - Audio and visual recordings, videotapes, videocassettes, cassettes, videodiscs, CD-ROMs, DVDs, memory cards, kinescope recordings of television programs and films of television programs. (32) - Telecommunications services, namely digital transmission of voice, images and video for the television, computers, phones, handheld devices and the Internet; delivering Internet Protocol-based applications over broadband networks; Voice and data network services providing businesses with applications, namely IP VPN Remote Access, business Internet dedicated, Ethernet Inter-networking, High-Speed services. (33) - Internet hosted applications. (34) - Pre-recorded video cassettes, pre-recorded videotapes. (35) - Calling cards, prepaid calling cards. (36) - Telecommunication services, namely broadcasting TV contents, images, video, sounds and voice communications by means of satellite, cable, fibre, switching and Internet technologies; Internet services, namely voice over Internet Protocol (VoIP) phone calls, recording and transmission of data, images, video, sounds, repertories, TV contents, voice mails, voice and video for conference applications. (37) - Delivering a hosted solution that provide customers with an advanced intranet management application enabling the automation of many collaboration and business processes by deploying horizontal and vertical solution templates, including customized modules and extranet applications. (38) - Printed or electronic matters and publications, namely telephone directories, television and mobile phones information magazines, manuals, guides. (39) - Web information namely, newsletters, magazines and guides that contain program-listing schedules with respect to satellite and cable television programs and pay-per-view television services, manuals for instruction, education and information. (40) - Telecommunication services namely providing online interactive and animated personages and animals for the exchange of information and advertisement applications. (41) - Telecommunications services namely, single and multi-line services, namely single access business lines and business access lines to customer systems; service enhanced calling features, namely voicemail messaging; video-email messaging. (42) - Computer game information provided by means of a global computer network, namely, an electronic computer game magazine and games on demand. (43) - Global communication network services, namely the provision of management services to supervise, review, direct and coordinate the operations of electronic communication and telecommunication networks; leasing access time to computer databases or networks in the field of telecommunications. (44) - Electronic mail services through wired and wireless access, paging services, wireless digital messaging services. (45) - Broadband network services and infrastructure for telecommunications companies including the selling and leasing of dark fibre to global computer networks or Internet service providers and other local exchange carriers; construction and maintenance of fibre optic, cable television, Internet and telephony networks; interconnection of customers between multiple fibre optic networks. (46) - Providing diagnostic and tools to repair Internet, phone and TV connections, email and Web-browser problems through a computer. (47) - Providing a push button signalling application for telecommunication services. (48) - Providing an application enabling subscribers to determine the origin of a call or the identity of the intended recipient. (49) - Providing an application enabling customers to move from analog business processes to digital business processes, and creating integrated electronic communications systems. (50) - Providing an electronic or digital facility enabling customers to exchange information for public and private sector commercial or official transactions by means of integrated electronic communications systems. (51) - Consulting, implementation, installation, development, integration, management, maintenance, support, logistic and repair services for computer hardware and software planning, development, design, testing, deployment, data storage, network infrastructure, security, privacy solutions and selection all performed for others. (52) - Business management consultation in the fields of telecommunications, systems integration services, facilities management; Installation, repair and maintenance services for custom and packaged computer software, for network monitoring and management; Installation, repair and maintenance services for computer hardware and software for diagnostic, control, monitoring, performance measurement and management information relating to telecommunications; installation, maintenance and repair services for telecommunication cables, wires and satellite-based equipment, parts, fittings and accessories thereof; undersea, underwater or underground cable and satellite repair services. (53) - Consulting services in the field of data processing and information management. (54) - Technical consulting services in the field of computers; computer services providing access to a computer database in the field of digital business services with a graphical interface to a global computer network for the transfer and dissemination of a wide range of information; engineering, consulting and computer software development services in the telecommunications industry, namely, interface analysis, design deployment, testing and database tracking of microwave broadband and satellite earth stations. (55) - Operation of retail outlets and stores, web sites, virtual stores where customers can purchase, rent or lease products and services in the fields of telecommunication, communication and home security. (56) - Manufacture, sale, rental, installation, delivery and operation of telecommunication booths, telephone kiosks and their components, parts, fittings and accessories thereof, namely telephones, computers, televisions and global network terminals. (57) - Global Positioning communication services, namely providing access to Global Positioning Systems (GPS) and cellular networks to enable users to obtain directions, locations, images and information from their mobile telephone, computers and hand-held devices; Providing a service used to track and locate people, assets and inventory by honing in a computer, on a wireless handheld device, modem or other device using GPS technology and cell tower triangulation combined (Assisted GPS); providing a service used to find the location of people, assets and inventory in a web-based environment on the computer, a wireless handheld or other device; Providing use of a Global Positioning System (GPS) application combined with a cellular network to track and locate people, assets and inventory by locating Assisted GPS-enabled cellular phones, wireless data devices, handheld devices, computers, portable computers (PC) and wireless-pocket computers. (58) - Telecommunication services, namely Internet hosted solutions providing Internet and wireless access to email messages, contacts list, calendars, tasks, notes, sharing file documents, through various computing devices such as computers, portable computers (PC), wireless-pocket computers, mobile wireless devices, namely, mobile phones, handheld computers and devices, personal digital assistants (PDAs) and smart phones. (59) - Design of digital broadband communication systems and networks for voice, video, cable television or data according to customer specifications in the fields of communications, telecommunications and electronic commerce, information management and data processing. (60) - Outsourcing services offered to customers in the fields of communications, telecommunications, the Internet and electronic commerce. (61) - Business consultation and support services offered to customers for providing management solutions in the fields of communication and telecommunication technologies. (62) - Education services, namely providing of training, conducting courses, classes, conferences, workshops and seminars to user in the field of communications and telecommunications, the Internet, the electronic commerce, information management and data processing. (63) - Communication services, namely radio and television broadcasting, and broadcasting distribution; Communication services, namely satellite television transmission services in the nature of non-programming information and interactive television services; Direct to home broadcasting by satellite and cable; Pay-per-view television services. (64) - Telecommunications services namely emergency assistance and dispatching services; public announcement service designed to allow message sponsors to provide live, passive or interactive public announcement messages to telephone and Internet customers. (65) - Recording for visually and orally received, for conducted or for broadcast transmission of messages or programs through all available commercial means, namely films, video tapes, discs, CD-ROMs, DVDs, electronic files and cassettes. (66) - Multimedia production and broadcast services, namely broadcasting of music, new, radio and television programs offered by way of multimedia applications including CD-ROMs, DVD, databases, global computer networks, the Internet, local computer networks, computers, television, radio and other means of communications. (67) - Entertainment services, namely the production, broadcast, recording, transmission and distribution of television programs and the operation of television and radio networks. (68) - Providing computer game information and game contest information by means of a global computer network, the Internet or local computer networks namely an electronic computer game magazine. (69) - Providing electronic games by means of a global computer network for the access to a wide portfolio of game contents; providing electronic game contests by means of a global computer network. (70) - Providing access to electronic directory consultation services, electronic mail services. (71) - Providing public multimedia kiosks (computer terminal, touch screen, keyboard, card reader, debit pad, printer) where customers can access the Internet and their e-mails. (72) - Advertising services namely, advertising the telecommunication wares and services for others; telephone directory services, data and voice telecommunication related service namely providing updated residential or business telephone number listings, addresses and directions. (73) - Promotional advertisements for others through global computer networks, the Internet, local computer networks, wire line, wireless phones, handheld devices and other available commercial means namely store flyers and product promotional material for others. (74) - Providing promotional services to others namely the sale and distribution of telecommunications services and equipment through sport-related promotions, sponsorships and through contests involving sport-related prizes. (75) - Promoting the sale of telecommunication services and equipment for others through the distribution of printed material and promotional golf and tennis contests; promoting goods and services for others by arranging for sponsors to affiliate telecommunication goods and services with golf and tennis competition. (76) - Telecommunication network infrastructure services namely, design, development and engineering of networks and equipment used therein; outside plant construction namely, installation of underground cable conduits and cable networks, cable testing; installation and upgrading of telephone central office equipment and DC power plant systems; project management in the field of telecommunication networks for others; providing emergency cable network restoration services; maintenance and repair of telecommunication networks, cable, coaxial cable and fibber optic splices; material management services for the telecommunications industry, namely, sourcing, purchasing, warehousing, transport and delivery and disposal of surplus or obsolete materials. (77) - Providing disaster recovery and restoration to telecommunications networks; Network infrastructure services provided to the wireless, broadband and microwave industry, namely, design, development, engineering, construction, network planning, installation and optimization of networks and equipment used therein. (78) - Providing cellular in-building coverage and billing solution, enhancing voice and data communications with the ability to interface with a customer's PBX (Public Branch Exchange) system, in using a single wireless handset or simultaneously on both cellular and land line phones using a unique dialling number. (79) - Providing audio, web and video teleconferencing services to others via telephone lines, cable, or wireless devices; Providing Web conferencing services for setting up and managing over the Internet; Web conferencing services providing an interactive voice and data conferencing platform offering document and multimedia hosting and archiving services, online collaborative content onto a traditional conference call enabling users to schedule calls online, to share and to archive collaborative document and applications through the Internet namely white boarding, pre and post-conference content (access, research and control tools), voice archiving, chatting, conducting polls via a Web Interface conference controls and instant access and Web touring (content, research tools). (80) - Provision of an incentive program for high use cellular telephone subscribers. (81) - Providing information though cellular telephones and handheld devices for communicating critical emergency information to public safety answering points. (82) - Providing call-routing services and monitoring telephone calls for notifying emergency facilities. (83) - Providing telecommunication bundles allowing customers to reach cellular phones, voicemail and call routing between wire line and wireless phones, voicemail boxes, computers, hand-held devices and the Internet. (84) - Providing bundles for telephone and Internet communications, television communications, prepaid telecommunications by calling cards, by cellular phones, by digital phones, by recordable, storage and subsequent delivery of voice messages by telephones, handheld devices and a global network. (85) - Rate plans for personal and business communications, for transmission services via telephones, handheld devices, computers, walkie-talkies; Internet rate plans; Cable and satellite television programming rate plans; rate plans for wire line and wireless telecommunication services bundles.